The market study, titled “Bisphenol A Market for Polycarbonates, Epoxy Resins and Other Applications - Global Industry Analysis, Size, Share, Growth and Forecast, 2013 - 2019”, makes for an informative report, having in-depth analysis of past performances, current trends, and future prospects of the global Bisphenol A market. 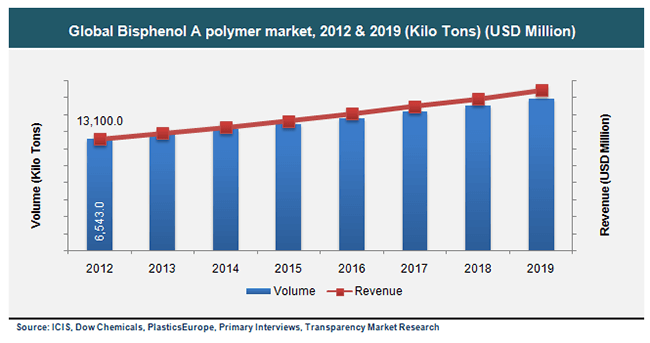 A new report published by Transparency Market Research (TMR) presents the analysis of the Bisphenol A market for polycarbonates, epoxy resins and other applications. The report discusses the present market condition and its impact on the future of the global Bisphenol A market. In 2012, the global Bisphenol A market recorded revenue of US$13.1 billion. The market is expected to grow significantly and reach a value of US$18.8 billion by 2019. The estimated CAGR at which the market will grow is 5.4% from 2013 to 2019. Bisphenol A is an organic, monochrome solid, which is soluble in an organic solvent. Generally, it is employed in the production of epoxy resins and polycarbonates. The demand for Bisphenol A is majorly driven by increasing demand from the electrical and electronics, and automotive markets. However, unstable prices of petroleum and high cost allied with the meager scratch resistance of polycarbonates are likely to cause negative impact on the market. The global market for Bisphenol A is analyzed on the basis of its applications and regional submarkets. On the basis of application, the Bisphenol A market is divided into polycarbonates, epoxy resins, and others such as unsaturated polyester resin, flame retardants, polyacrylate, polysulfone resins, and polyetherimide. Dominating the market with 70% of the total share in terms of volume, polycarbonates were the dominant application of Bisphenol A in 2012. Polycarbonates are widely used in baby bottles, water bottles, electrical and electronic equipment, sports equipment, and food and drink packaging amongst others. Furthermore, rise in demand from medical devices, dental equipment, composites, and sealants are likely to present a strong demand for polycarbonates in the near future. Food and drink, and automobile applications dominate the global Bisphenol A utilization. The positive inclination of the market is driving the Bisphenol A market across the globe. The electronic equipment and sports equipment application segment is one of the fastest emerging end-user markets in the Bisphenol A industry. On the basis of geography, the Bisphenol A market is categorized into North America, Europe, Asia Pacific, and Rest of the World. Asia Pacific led the global Bisphenol A market, holding around 50% of total market share in terms of the total volume consumed in 2012. The Bisphenol A market was majorly propelled by developing economies such as India, China, and Brazil. The Bisphenol A market experienced a decline in demand owing to the global economic recession in 2008-2009. However, since then, it is showing a steady rise in demand owing to an uptrend in the end user market after the revival of the global economy.